How yummy does that sound!?! I love caramel apples and candy apples! However, I get a little disappointed when all the magical goodness disappears and all I am left with is an apple on a stick. This is a terrific alternative to whole apples. 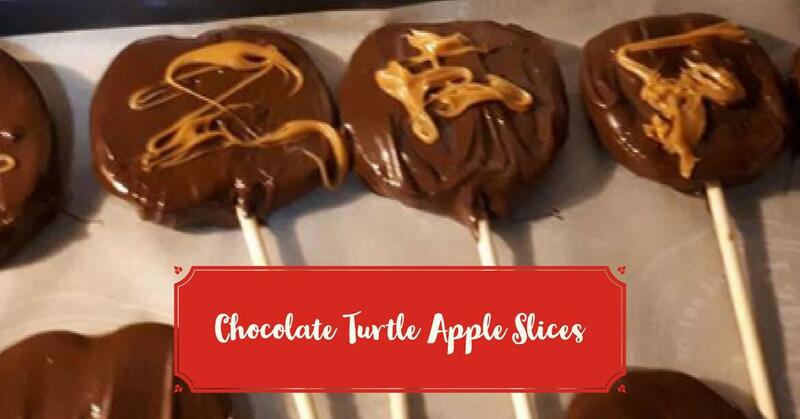 Not only is there a treat in every bite, but the littles in my life (and yours, too) can handle these a whole lot easier!! I believe there may be a video tutorial on there as well. I didn't watch It - and probably should have. My slices did not turn out as neat as hers! Dip apple slices in chocolate and place on parchment lined cookie sheet. Place caramels in microwave safe bowl and microwave on high for 45 to 60 seconds. Do not overheat!! Stir until smooth. Apples are best the first day. Store in fridge.